Many moms hand their little one a baby spoon to hold while they feed them.We looked at the 15 most popular baby spoons on the market and considered the materials they were constructed with, the design and shape, the color choices available, the length of the spoon, and other considerations. The three products that we have reviewed below surpassed the rest in all the categories we considered. Any one of these choices would make an excellent baby spoon for your little one to get started with on their journey to learning to feed themselves. Watching your baby grow and increase their skills is a bittersweet time. On the one hand it is exciting to watch them learn new skills. On the other, many parents feel a bit sad to see their babies growing so fast. One of the major milestones a little one encounters in their life is learning how to feed themselves. This typically starts happening after 6 months of age when they start eating baby food. Many moms hand their little one a baby spoon to hold while they feed them. Choosing the right baby spoon is important to the success of your baby learning to feed themselves. A regular spoon, even a tea spoon, is way too difficult for little hands to maneuver. There are many different styles and designs of baby spoons available. Deciding which one to purchase can be really overwhelming, especially for new parents. Not all spoons are created equal so it benefits the parent to learn so pointers on how to choose the best baby spoon for their child. Ashtonbee has provided parents with an easy to use spoon that is soft and easy on the baby’s tender mouth. It is a great spoon to use to introduce your baby to solid foods and is designed for the first stage babies who are just getting started. 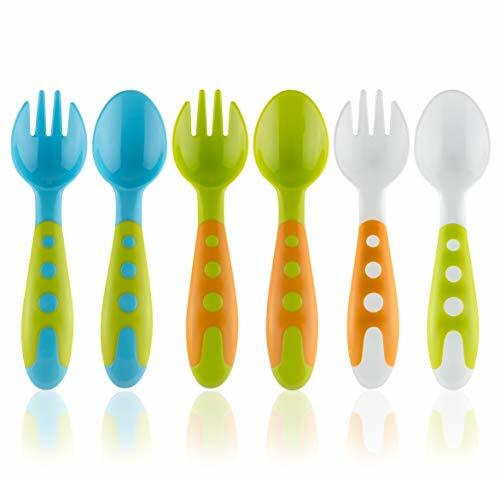 There are 5 spoons in each package in different colors that are made of soft silicone. These spoons are a little bit longer than other types of baby spoons to make feeding easier. The soft material that these spoons are made of protects the baby’s gums from getting bruised or damaged. Babies move a lot in general and can be fidgety while you are first teaching them to eat baby food. Their soft gums can be damaged by the edge of a regular spoon or metal baby spoon. This potential problem is eliminated with the soft silicone material of Ashtonbee spoons. There is a bonus oral massager that comes with these spoons. The oral massager is a gentle way to keep the baby’s gums and new teeth clean. These great beginner spoons are covered by a 100% lifetime warranty. Avanchy is a well known and loved baby product brand that produces quality baby products. 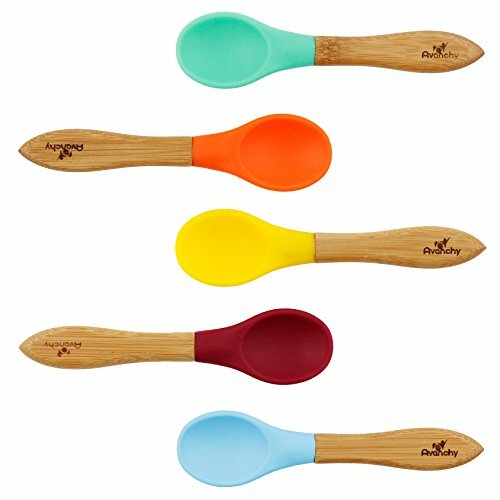 They have created a revolutionary bamboo and silicone baby spoon that has many features that parents will love. Each pack contains 5 spoons in a variety of cheery colors. The color of the spoon tip coordinate beautifully with the bamboo so these spoons are not only functional, they are attractive too. Avanchy bamboo spoons are FDA approved and fully organic. The silicone piece is removable so the spoons can be thoroughly cleaned for the ultimate safety of your baby. The bamboo is biodegradable and BPA free as well as made from food grade silicone. They are soft and gentle on your baby’s mouth and are 5 ½” long so feeding is easy too. These spoons match the stay put bowls and the divided plates perfectly which makes a great baby shower gift. There are no harmful chemicals in the creation of these spoons and they are lead free as well. They guarantee their products 100% against any manufacturer’s defects. If there is ever anything wrong, the company will replace them. Lullababy does it again with this travel safe training spoon and fork set. There are three different colored sets in this pack for you to use for your baby. It comes with a travel case so your baby’s fork and spoon stay clean and sanitary. These spoons are very easy for the baby to grip and it’s soft too so there is no danger of the spoons damaging the baby’s soft gums or sensitive teeth. The rounded edges of the fork and spoon have no sharp parts and they’re FDA approved. They are also latex free, FDA approved, BPA, lead and phthalate free too so your baby is not exposed to any chemicals when you are using these utensils. This is a terrific set of baby utensils that will be an excellent way to get your baby used to holding and using a spoon. You can let them hold one while you feed them with the other. These spoons and forks are dishwasher safe and have a lifetime warranty as well. They are perfect for a baby shower gift. If you have a drawer full of regular spoons you may think it’s unnecessary to purchase baby spoons but this is not true at all. The regular teaspoons that are normally in most people’s silverware drawer are not designed for infant use for many reasons. They are too big for a baby’s small mouth, and the metal of these spoons can damage or hurt the baby’s tender gums and teeth. If the metal spoons hurt the baby while you are trying to introduce them to feeding themselves and eating from a spoon, it can cause them to refuse to eat. Using the right spoons that are designed specifically for babies can make the whole process of learning to use a spoon much more enjoyable. The three products featured above are all excellent choices to get started with feeding your baby solid foods. They are all chemical free and made from materials that are designed to be easy on your baby’s gums and teeth. They have a variety of colors and shapes that will make feeding your baby much easier. If none of the choices we have featured here are quite what you’re looking for, read the following buyer’s guide to learn more about choosing the right baby spoon. The information contained in this guide will give you the specifics that you need to choose the right baby spoon for your child. Although it may seem like a simple choice to make, ensuring that you choose the right one will get your baby off to a great self-feeding start. There are several things that you need to look for when you are shopping for the right baby spoon. We’ve listed the different points that are important in determining which spoon you should select. Soft tips – Metal spoons can hurt or damage your baby’s soft gum tissue or bang their teeth. 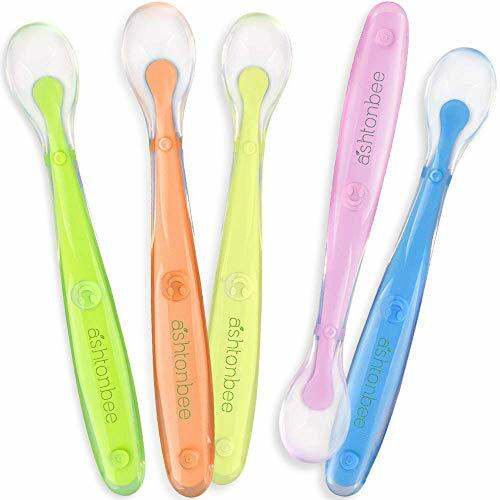 Soft plastic or silicone spoons will protect your baby’s mouth regardless of how hard they choose to bite down on the spoon. Once they learn how to use the spoon properly, they can transition to a metal spoon but this is best done for a toddler who can understand how not to hurt themselves while eating. Flat tips – Baby spoons are usually flat so it is easier to use the spoon to get excess baby food off of their mouths. They are also easier to get the food off of initially. Weighted – The weight of a baby spoon is something that many don’t think about when they are looking for the right one. A nicely weighted spoon is easier to use for the parent. It isn’t a critical point but most parents like the feel of a heavier spoon. The baby may prefer the lighter ones, but this will vary from baby to baby. There are dozens of different baby spoon designs available to choose from. If you like no nonsense designs, there are plenty standard baby spoons that are simple in design and that have a silicone end and a simple stick style handle. These handles are not usually easy for a new feeder to hold but they work fine for parental feeding. Other styles of baby spoons include bamboo handles, spoons that have wavy handles made of silicone, spoons that are in the shape of dinosaurs or cars and other shapes. Some spoons are made in two pieces with the silicone tip being removable and others are all one piece. All of these work well for your baby, so for the most part, as long as you ensure that the tip of the baby spoon is made from silicone or plastic, the shape and design can be left up to personal preference. The majority of babies will start using a spoon just after 6 months when they are introduced to solid foods. One of the best ways to get a baby used to a spoon is to give them one to hold while you feed them with another one. After awhile you will notice that they try to feed themselves while you are feeding them as well. Training or learning spoons are your baby’s first spoon. They usually have larger, chunkier handles that are much easier for the baby to hold and the spoon part is designed in a way that keeps as much of the food as possible on the spoon. There are a few characteristics that training spoons have. No sharp points – Adults want their forks and knives to be sharp so they can stab and cut their food but these sharp points mean disaster for a little one that has just gotten started using utensils. Babies will miss their mouths a lot while they are first learning and stabbing themselves in the cheek or eye can be disastrous. The rounded soft edges of a training spoon make it impossible for them to hurt themselves even if they do poke it in their eye. If you’re shopping for forks as well, look for rounded prongs or look for designs that are also called sporks where the prongs curve inward. Shorter handles – While the spoons that a parent uses to feed the baby themselves are easier to handle when the handle is longer, the spoons that your baby holds to feed themselves are much easier to manage when they are shorter. It is very difficult for a baby to manage a long handled spoon and more food will be dropped off the spoon on the way to their mouth if they are trying to navigate the long handle. Thick handles – Thick spoon handles are much easier for little, chubby baby hands to hold. Babies don’t have a lot of dexterity when they are first holding utensils, so having a thicker handle to grip is much easier to maneuver than a thin one. It’s also easier for them to keep the tip of the spoon more level when the handle is thicker because it won’t roll in their hand. There are several safety issues you want to keep in mind when it comes to choosing the right spoon for your baby. We’ve listed these important safety tips so you will be aware of them. BPA-Free – BPA is an ingredient that was used in plastic to make it clear and hard. It was banned by the FDA in 2012 from baby bottle and cups due to the fact that concerns were surfacing about it having a role in endocrine disruption. Nowadays, the majority of baby products that are plastic are marked BPA free. Always look for plastic products that state they are BPA free and never assume they are. If they are not clearly marked on the package as BPA free, more than likely they are not. No Microwave/ Dishwasher – If you have plastic spoons, it is recommended not to put them in the microwave or dishwasher due to the fact that the processes used to microwave or wash them can weaken or compromise the plastic and make it unsafe for the baby to use. Alternatives to plastic include bamboo and silicone, metal and glass. Remember not to start your baby out with a metal spoon. Check Recalls – Baby products can be recalled at any time, so it is a good idea to check recall lists that are found online, for updated baby product recall information. This will help you keep your baby safe. It is not complicated to find a good quality baby spoon and as long as you keep the information provided in this buyer’s guide in mind, you are guaranteed to choose a good spoon that will make the transition from only bottle feeding or breast feeding to eating solid foods as well, much easier and enjoyable. With the dozens of baby spoon choices, you have a lot of variety to choose from. As long as you keep the basic points in your mind as you search, you will get a good quality baby spoon for your baby to get started with. Look for packs of more than one spoon so you will have several in the event one is dirty.